The Brussels I Regulation (EC) No 44/2001 on jurisdiction and the recognition and enforcement of judgments in civil and commercial matters is one of the most important instruments of European Private International Law. Despite its overall success, some shortcomings have been perceived during its first ten years of application and have prompted the drafting of a Review Proposal by the European Commission. The Proposal addresses issues such as the relationship between the Regulation and arbitration, the compatibility of its provisions with the 2005 Hague Convention on Choice of Court Agreements, and the extension of the Brussels I rules on jurisdiction to third State defendants. These issues and more are analysed and debated in this book by academics and practitioners from various Member States and institutions, including the Hague Conference on Private International Law and the European Group for Private International Law (EGPIL). Their insightful commentary on the Commission's plans for amendment of the Brussels I Regulation is an excellent resource for anyone dealing with issues of cross-border civil litigation. Eva Lein is the Herbert Smith Senior Research Fellow in Private International Law at the British Institute of International and Comparative Law in London. She previously held the position of Head of the Continental Law Section and Staff Legal Adviser at the Swiss Institute of Comparative Law in Lausanne, Switzerland. She is a qualified German lawyer and her fields of expertise are comparative, European and private international law. Her PhD focused on European, international and comparative contract law, but she has also extensively published on European private international law. She has lectured comparative law, conflict of laws and international litigation in England, Italy, Spain and Switzerland. 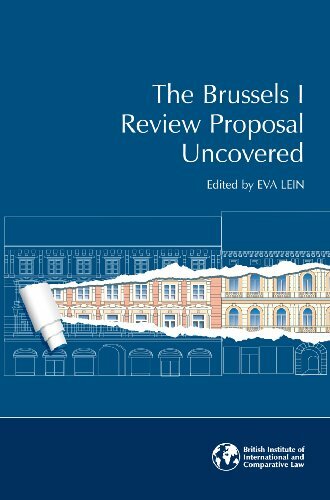 "The Brussels I Review Proposal Uncovered"